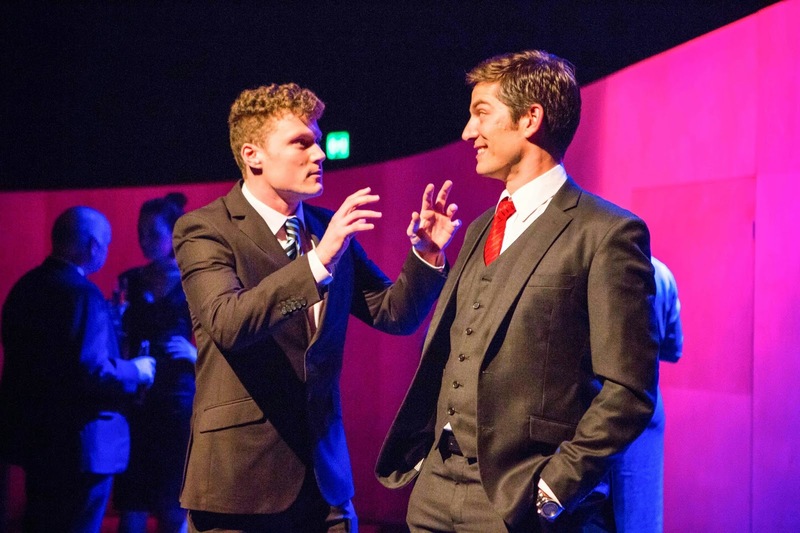 Darlinghurst Theatre Company and Spooky Duck Productions present THE YOUNG TYCOONS - A Ruthless Comedy, by CJ Johnson at the Eternity Playhouse. Season: 16th May - 15th June. We have not re-set the play in the present - it could not exist now, precisely because of how much it is set then - but we've given it a polish, using time's passage to inspire a few new cutting barbs. After all, truth is very often even funnier than fiction. Based loosely around the 'shenanigans' of two of the prominent business families of Australia, THE YOUNG TYCOONS, when first performed, probably carried the comic audacity of the 'currentness' of the episodes, and satiric caricatures, and, even, may have had the vigorous wallop of the shock of the audacity of it all - one may have enjoyed, the 'naughtiness' of the slimly veiled disguises given to reality, in the families of the text: The House of Vogler and The House of Warburton. That was then, 2005-06. Nowadays, however, in 2014, with the recent, regular, commercial television dramatic impersonations of these families, these figures now have a kind of popular secular hagiology (much like the jingoistic Ned Kelly mystique) that have caused some of us to give them a kind of benign nod of admiring approval, similar to the established regard the Americans have for their 'Robber Barons' of old, who now have reputations of Social Benevolence through gifts to Education and Cultural Institutions. (N.B. the recent promise of monies to the Arts, from an excellent Aussie family, the Packer's - the government very pleased, no doubt, to see this level of philanthrophy from the "rich" - my inner cynic presumes it is tax deductible, and nothing to do with Barangaroo). Time, indeed, has misted the satiric targets of this play and their machinations with glycerined lenses. And, truly, the recent 'bogan' wrestle/boxing match, between two business men, on the Bondi Beach front, could not be funnier than anything concocted for our satiric stages - and, after all, someone once said, in some context: "all the world's a stage". So, it is "the few new cutting barbs" (and they are very few and not, particularly, barbed) that scored the biggest sly laughs on the night I saw this production - e.g. the last scene, on a waterfront wharf where our two young tycoons look at the potential of development of that site! Given this play was announced to be part of this season at the Eternity Theatre over 12 months ago, the relative lack of updating of the material, was a kind of surprise - it's not as if the play extant is 'genius' or even a "Ruthless Comedy" as it's sub-title suggests - ruthless, in definition in the Aussie Macquarie dictionary being: 'without pity or compassion; pitiless; merciless'. THE YOUNG TYCOONS, is hardly any of that: genius or pitiless or merciless, and truth/fiction, indeed, 8 years later, may not be, necessarily funnier. THE YOUNG TYCOONS is, relatively, a relic of comedy of the recent past, in this contemporary outing at the Eternity Playhouse. There is a lightweight and undemanding comic veneer to the evening, delivered by a terrific team of actors with, I noted, a little nod of comment (perhaps imposed by the skill of the actors) to the misoginistic atmospheres apparent around this high flying world. It is a mildly amusing way to spend some money and time, if you have it to spare. The structure of the writing, of short sharp scenes, introduced with projected titles of guidance as to what we will witness, accompanied with a comfortable and witty score by Murray Jackson, feels rather like the scenario of a screenplay than a play for the theatre. The actual necessity of the many stagings of much furniture, for all those many scenes, and thence the numerous needs of entrances and exits, through the only two doors of the widely designed set wall (Katja Handt), interrupts the accumulative rhythm of the performance, and diminishes the accuracy of the necessary music of comic timing. The secret of good comedy is all in the timing, I read somewhere. Briallen Clarke, as Kylie Strauss, is especially fine in her work; Paige Gardiner, as Sally Kilmarten, fleshes out her woman with a sly comic eye and a sympathetic wisdom; Gabrielle Scawthorn, as Sherilyn Moss, creates a two dimensional woman out of a pencil thin observation by Mr Johnson - all three of the female actors, indeed, demonstrate a creative inventiveness that give the writing more depth and character than is there on the page, I suspect. Congratulations! While James Lugton, Laurence Coy, John Turnbull, still finding their securities of rhythm, on the night I saw the production, also had a clear understanding of what was required of them in the landscape of the material. All of the ensemble are empathetically integrated to keep the play pulsing with some comic energy, sometimes over and above the offers of the source writing. Edmund Lembke-Hogan gives an over-the-top caricature of puppy-dog dimwittedness, as Kim Vogler; Andrew Cutcliffe, firmly grounded in handsome smooth realities, as Trevor Warburton; and Terry Serio, as Donald Mayes, a kind of honest but grubby Aide de Camp to the House of Warburton, shuffles and shrugs in an ill fitting suit to some effect. Every Darlinghurst Theatre Company production brings together a new team of outstanding artists, who present their unique artistic vision and perspectives on theatre and Life. We offer artists freedom to stage their own work and tell the stories they want to tell. This allows us to create a diverse season of innovative and exceptional theatre, and ultimately a fresh experience for our patrons each and every visit. The Darlingurst Theatre Company having just presented at the Eternity Playhouse, the fourth season of THE GIGLI CONCERT, and now the third season of THE YOUNG TYCOONS (in Sydney), for their 2014 season, hardly seems to be "innovative" or "fresh". ALL MY SONS and FALSETTOS gave proof and promise of the Darlinghurst Theatre Company and their mission, vision, in service to the Sydney theatre scene. There must be plays and productions galore, available to the artistic 'gatekeepers' to curate their season from, or, is it an embrace of the the corporate 'Mortein' philosophy: "When you're on a good thing, stick to it", that has driven such recent 'conservative' choices to occupy this new theatre space?